My gals pals and I had our Fantasy Football draft the other night. Three years ago, we thought “heck, wouldn’t it be fun to make our own Fantasy Football team and pick all of our players based on 1) cuteness 2) level of hot body’ness?” Well, let’s just say that this strategy didn’t get us too far in terms of winning anything. But, it was a great excuse to sit by the T.V. every Sunday hooting and hollering alongside the men – although we were hooting and hollering at tight camera shots of bums and other body parts vs. touchdowns and field goals. Last year, it got a little more competitive – my friend Erin took over the roll of commissioner. By day, Erin is this cute little CPA who works for the IRS – on Sunday’s during football season though, she’s a crazed, football-jersey-wearing maniac that screams at the television and sits with her legs open staring intently at the television holding her breath to see what the next play brings (ok, maybe I’m exaggerating at the sitting w/ her legs wide open part – everything else is 100% true!). With Erin as commissioner, we started to take things a little more seriously, and really started to care about more than how long Tom Brady’s hair had gotten or if the camera’s shot to our favorite celebs in the stands during games. We actually like, paid attention – and made changes in our roster every week – and like, kind of knew what was going on! And this year’s draft was a nail biter, probs the most stressful hour and a half that I’ve had in a while. While we may be ladies Monday through Saturday, on Sundays, the claws will be out. But we need sustenance to keep ourselves going during hours and hours of football watching. Delicious food goes hand in hand with football season – chilli – wings – dips of all kinds – which is what we have today! 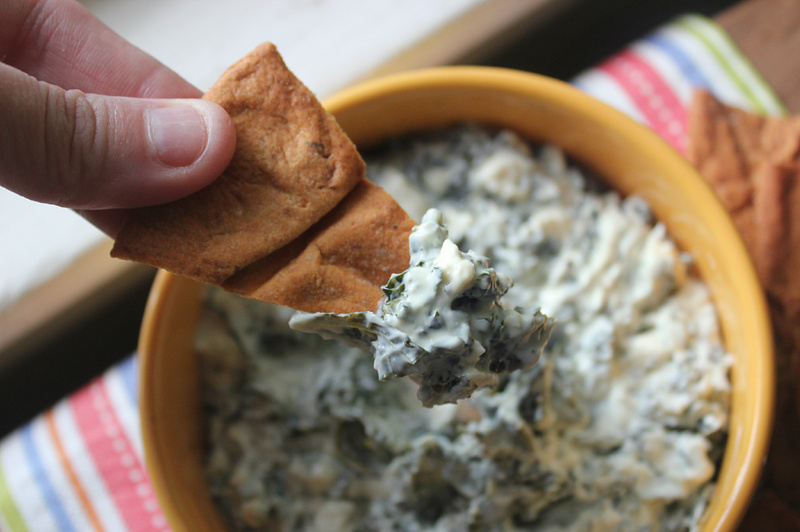 I’m a huge Spinach dip lover, so this is a Skinny version of a great Sunday Funday snack, made with Kale and Feta Cheese (you could easily use spinach too, I just wanted to shake things up a bit) and homemade pita chips! I am OBSESSED with the Josephs© line of sandwich wraps. They have pita bread, wraps and lavash that are all only 2 WW points each! And, they made amazing home made pita chips! 2) In a medium sauce pan, sautee minced garlic and chopped kale over medium heat until it shrinks to about 1/2 it’s original size. 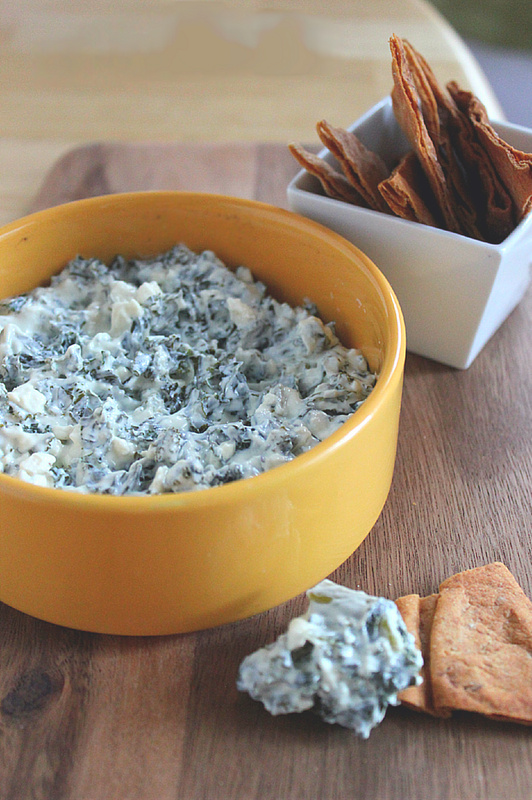 3) Place cooked kale in a large mixing bowl and add cream cheese, sour cream, feta and lemon juice and mix until combined. Add salt and pepper as needed. 4) Place in an oven-safe baking dish and sprinkle grated parmesean cheese on the top. Cook for about 10 minues, or until bubbly. 5) Slice the pita breads into 8 triangles (16 total). Spray with non-stick cooking spray and sprinkle with salt and pepper. Bake in oven about 5 minutes on each side, until chips reach desired level of crunchiness. TOUCHDOWN! 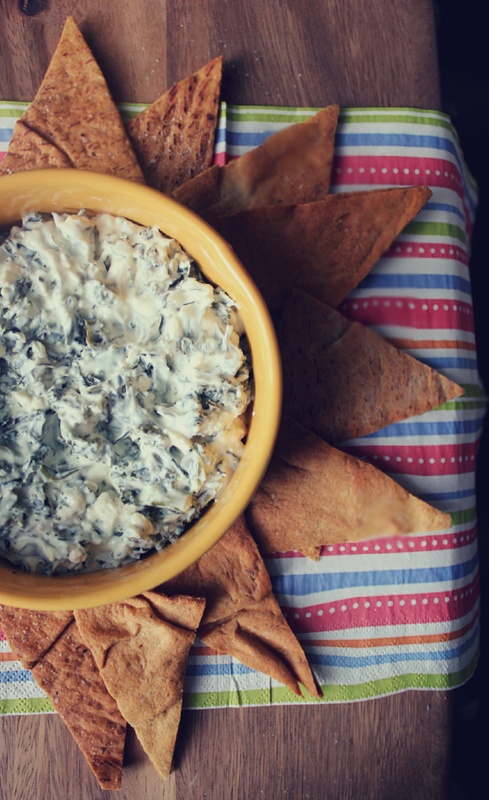 A delicious dip, that can be served hot or cold, that is only 3.5 WW points per serving. So if you were so preoccupied with the action and ate the whole thing by mistake, it wouldn’t be so bad! 2) Capitalize on the freshest produce of the year! 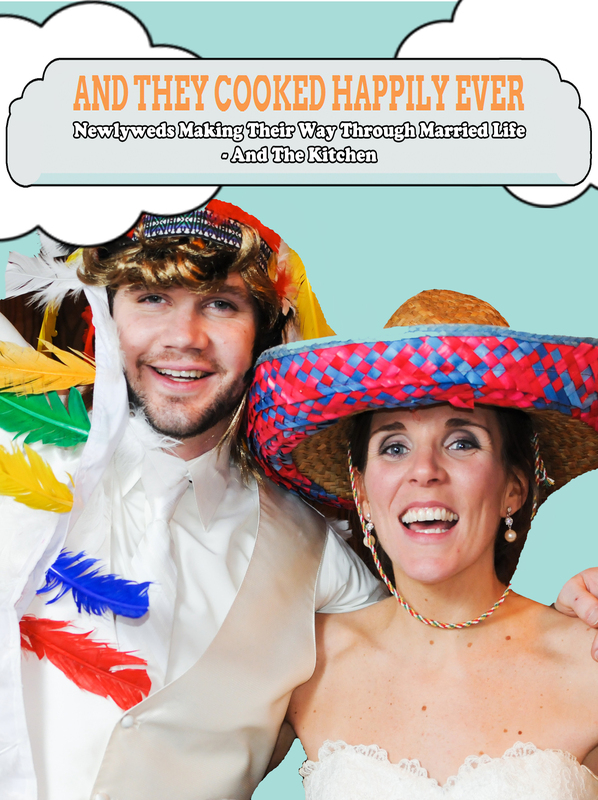 And these next recipes will be nothing but bikini friendly. In only a couple short weeks, it’ll be time to stuff ourselves in sweaters and shovel in the chilli w/ cheese, sour cream and fritos while watching Sunday football. HOWEVER, until then, let’s keep it on the skinny, shall we? 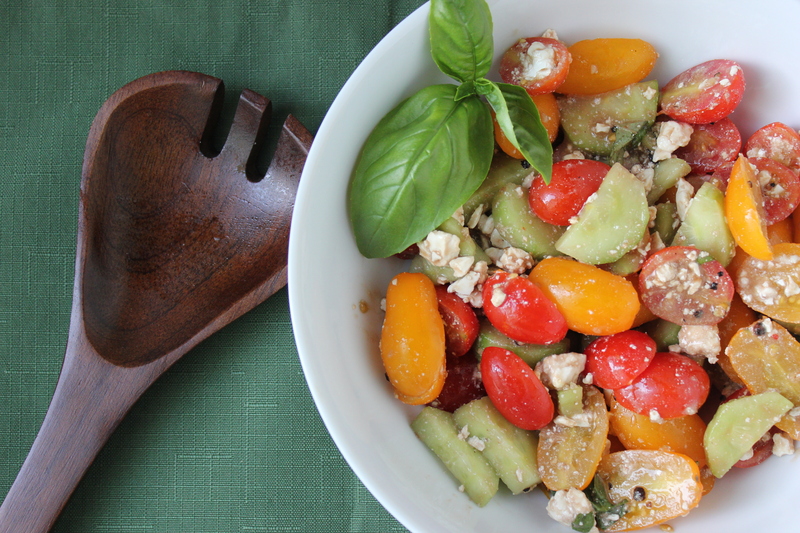 This Summer Bruschetta is SOO freaking delish, a take-off on that delightful Tomato, Cucumber & Feta Salad. I think I’ve made it about 7596943 times this summer. 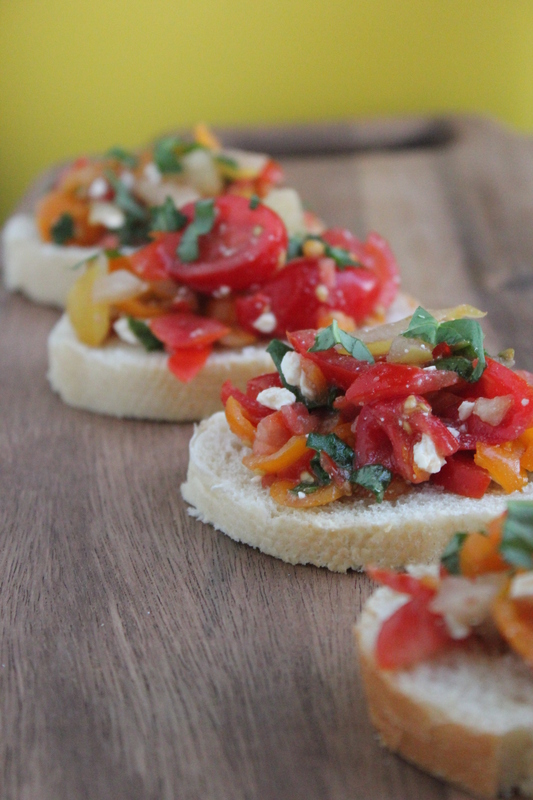 It’s easy – it’s healthy – and there’s no better way to showcase one of summer’s star veggie-fruits than with bruschetta. 1) Chop tomatoes into small pieces or pulse in the food processor a few times until they reach your desired size. Place in a mixing bowl and set aside. 2) In a small mixing bowl, whisk together italian dressing, balsamic vinegar and minced garlic. Pour mixture over the chopped tomatoes and fold with a spatula. 3) Add fat-free feta cheese and chopped basil and fold into tomato/dressing mixture. 4) Let the mix sit for at least 1/2 hour. I personally like letting it sit at room temperature (cold tomatoes = yucka) but you could also chill it in the refridgerator. 5) Serve on sliced french bread or crackers! 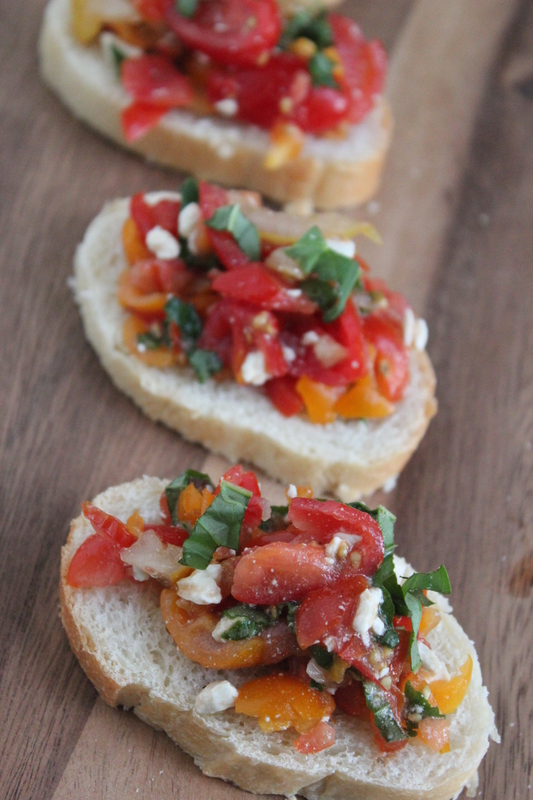 You can adjust this recipe as you see fit, adding more/less basil & feta cheese, but the ENTIRE bowl of bruschetta (minus the bread/crackers) is only 3 WW points – 3. Whole thing. Chilli can wait! On several occasions these past few months, I have feared that an apocalypse is nearing the city of Boston, because MAN has the weather been GORGE! This winter was beyond strange – I think we had a full week of 80 degree weather in March and after last year’s weekly 8-12 inches of snow, even the lightest of flurries didn’t last more than a few hours this year. We’ve had some rain recently, but personally, I enjoy a rainy day or two – justifying extreme couching and Bravo t.v. watching is a lot easier when the weather is ick. And, the ‘greenness’ of everything is beyond beautiful! For some reason nice weather makes me think of salads – perhaps because the veggies and fruit are so fresh and pretty, I want to use them as much as possible – or because nice weather means that it won’t be long before I have to unlock the safe and blow the 1 inch layer of dust off of my bathing suit. So the other night for dinner, it was a delicious chicken breast made by Dave, with fresh Rosemary and Tyme from our ‘porch garden’ (Dave is OBSESSED with this Boos Block Mincer thing we got and is finding any excuse to use it) and this yummy Tomato, Cucumber and Feta salad I put together! I’ve recently really come to like Feta, and the fat free version of it is a nice option if you’re looking to add a little flavor to something. Would I stick a spoon in there and eat it like peanut butter? 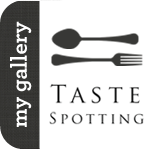 Ehhh maybe not so much, but, it can really accent some dishes nicely. Of course you can use the regular version too if you like! 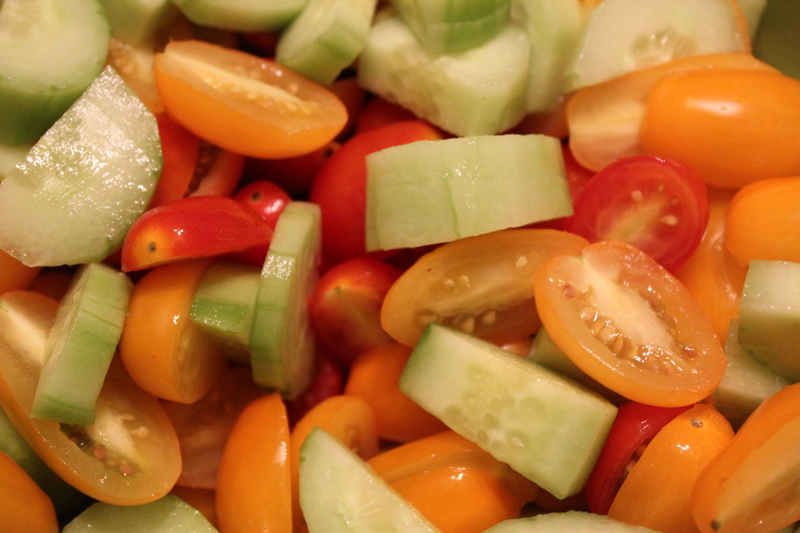 1) Slice the grape tomatoes in half and place in a large mixing bowl. Then peel the english cucumber, cutting it lengthwise down the middle and then slicing the two halves. Add to the tomatoes. Then add the feta cheese and toss lightly. 2) In a small mixing bowl, whisk together the balsamic vinegar, italian dressing, minced garlic and salt and pepper. 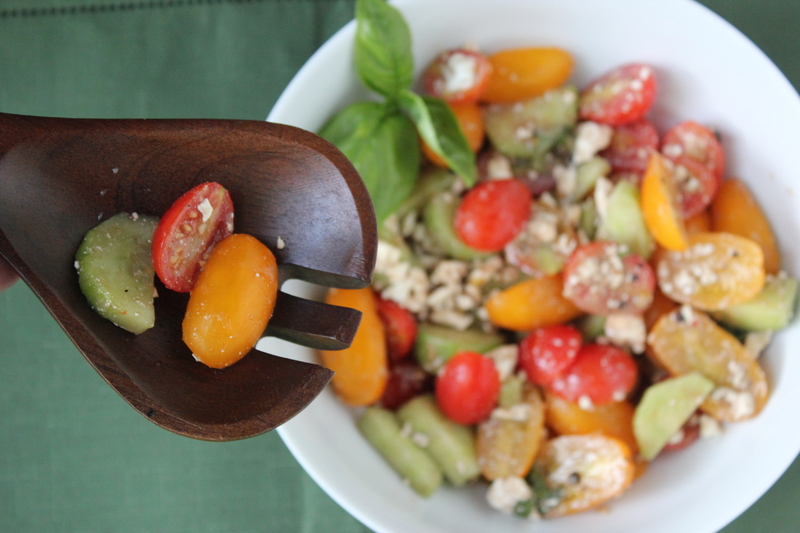 3) Lightly toss the tomato/cucumber/feta mixture in the balsamic dressing mixture until combined. 4) Sprinkle the chopped basil over the top, or mix in the salad – whatever your preference.